NeuroProtek Low Phenol® is a unique all natural oral dietary supplement in a soft gel capsule which may promote harmony in and between the mind and body. NeuroProtek Low Phenol® uses an exclusive combination of flavonoids and has lower milligrams of Quercetin and specifically Rutin (known to be high in phenols) than our original formula, NeuroProtek. NeuroProtek Low Phenol® is formulated to maximize effects of flavonoids while also overcoming any absorption obstacles. 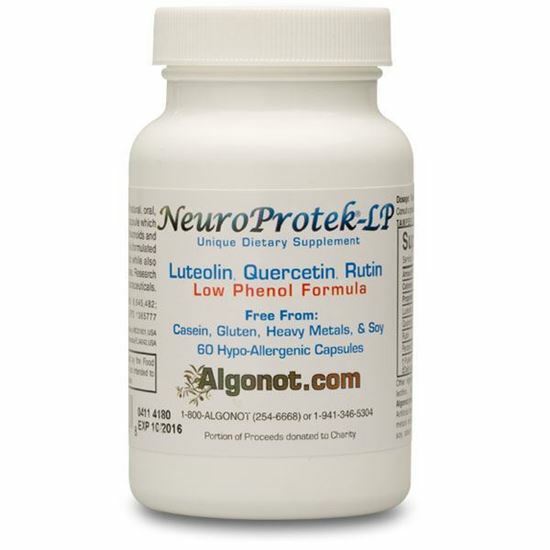 NeuroProtek Low Phenol® contains the flavonoids: Luteolin, Quercetin, and Rutin. Unique to Algonot’s family of formulations is olive kernel extract and flavonoids. Algonot put great care and consideration in the selection of ingredients. For each ingredient attention to the source, purity and absorbability where given to develop the most beneficial product with the least amount of associated risk. NeuroProtek Low Phenol® is free of the following allergens: artificial colors or dyes, flavors or sweeteners, corn, eggs, fish, heavy metals, milk/casein, peanuts, preservatives, salt, shellfish, starch, sugar, tree nuts, wheat/gluten and yeast. Our ingredients are not obtained from beef or beef by-products. Luteolin (> 95% Pure) is a nutrient from a class of naturally occurring molecules known as bioflavonoids. Luteolin was incorporated in this formula after published papers showed it is important in the body as a free radical scavenger. Quercetin ( > 95% Pure)is a natural non-acidic flavanoid. The quercetin used is NeuroProtek is obtained from the saphora plant. Algonot decisively choose not to use the more common and less expensive source of fava beans. Rutin (> 95% Pure) is a glycoside of the flavonoid Quercetin. Like quercetin, rutin is extracted from the saphora plant and is a non-acidic natural flavonoid that adds additional anti-oxidant qualities. Rutin helps liberate quercetin in the intestine, making absorption easier. Rutin has been shown to be the strongest antioxidant in studies. Olive Kernel Oil (Unprocessed, MicroFiltered) is a natural, potent low-acidic anti-oxidant. This unique oil (a lipid) plays an important role in NeuroProtek® as it is used to increase the absorbability of flavonoids. We use only virgin olive seed oil from the island of Crete, Greece. Flavonoids are naturally occurring compounds frequently found in green plants and seeds. In powder form, whether taken as pills, tablets or hard capsules, all flavonoids are difficult to absorb and are extensively metabolized to inactive ingredients in the liver. In fact, less than 10% of orally ingested flavonoids are absorbed. In addition, very few flavonoids are beneficial; instead, many others such as morin show no activity, while pycnogenol is weakly active (as compared to luteolin or quercetin) but could cause liver toxicity. As an additional consideration, the most common commercial source of the flavonoid quercetin is fava beans, which can be detrimental to blood cells in those of Mediterranean origin (15%), who lack the enzyme glucose-phosphate dehydrogenase (G6PD). Quercetin and its closely, structurally related flavonoids – rutin and luteolin, have potent anti-oxidant actions. Can other preparations of the elect flavonoids be used? have only the select flavonoids, DO NOT specify either the source or the purity of the flavonoids. This problem is even worse given that many people could have reactions to the impurities, fillers or dyes. of associated risk, NeuroProtek LP®. NeuroProtek Low Phenol® is not an analgesic. NeuroProtek Low Phenol® should only be taken in suggested dosages. NeuroProtek Low Phenol® should be stored in a cool temperature place away from children. You do not need a prescription to order NeuroProtek Low Phenol®. NeuroProtek® is a unique all natural oral dietary supplement in a soft gel capsule which may promote harmony in and between the mind and body. NeuroProtek® uses an exclusive combination of flavonoids, based on the published scientific research. NeuroProtek® is formulated to maximize effects of flavonoids while also overcoming any absorption obstacles. 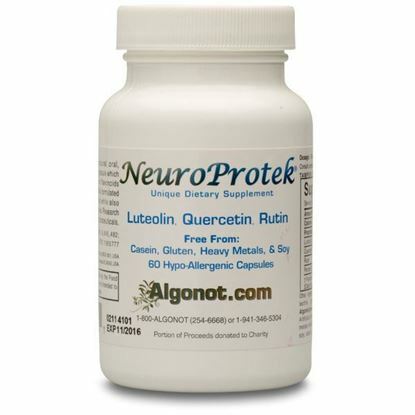 NeuroProtek® contains the flavonoids: Luteolin, Quercetin, and Rutin. Unique to Algonot’s family of formulations is olive kernel extract and flavonoids.